On April 22, 1967, twenty-six sisters founded the Epsilon Iota chapter of Alpha Xi Delta at Newberry College. Alpha Xi Delta was the first sorority on Newberry's campus and were later joined by two other National Panhellenic Sororities. The Epsilon Iota Chapter of Alpha Xi Delta has continued to grow over the years and currently has 44 active sisters. The ladies of Alpha Xi Delta are focused on being successful, well-rounded ladies that spread love and happiness through their actions. Alpha Xi Delta’s major philanthropy is Autism Speaks for which they host the Light It Up Blue Week. Over the course of the week, the sisters of Alpha Xi Delta host various fundraisers such as bake sales and raffles benefitting Autism Speaks. 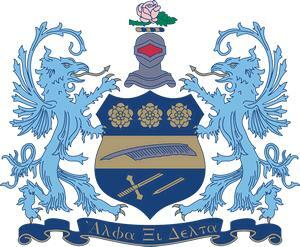 Mission: The mission of Alpha Xi Delta Fraternity is to enrich the life of every Al-pha Xi Delta through the decision to nurture unity and cooperation, foster intellec-tual, professional and personal growth, exemplify the highest ethical conduct, in-still community responsibility, and perpetuate fraternal growth.